As Cardinal, New Pope Walked Fine Line On Economic Issues The former Cardinal Jorge Bergoglio has both opposed liberation theology as well as criticized capitalism. And while Pope Francis' positions are in line with his predecessors on economic matter, his Latin American background may lead to an emphasis on those issues. The former Cardinal Jorge Mario Bergoglio walks outside the chapel during a Mass at the Barracas neighborhood in Buenos Aires, Argentina, in 2003. Bergoglio, who became Pope Francis, is said to have the same position as his predecessors on economic matters. He took his name from a 13th century saint who gave up his wealth and threw in his lot with the poor. As cardinal in Argentina, he eschewed the trappings of power and privilege, taking public transportation and even cooking his own meals. Unlike his predecessors, the newly elected pope, Francis I, hails from a part of the world that in recent years has struggled with poverty and financial turmoil, and his writings and public comments make clear his sympathies lie with the world's desperate and destitute. In the process, he has sometimes cast a suspicious eye on the institutions of capitalism, once branding the International Monetary Fund's debt policies "immoral." And yet anyone who expects the new pope to usher in a period of liberal activism by the Catholic Church on economic matters will probably be disappointed. Even as the former Cardinal Jorge Bergoglio was blasting "the tyranny of the markets" and lamenting wealth inequality, he was standing firm against the spread of liberation theology — the leftist economic movement that swept the church in the 1970s and 1980s. "He's not afraid to duke it out with either the right or the left, inasmuch as neither system really delivers any authentic notion of liberation," says Michael Sean Winters, who writes a blog for the National Catholic Reporter. In the United States and the West in general, the church is often seen through the prism of social issues, like abortion, contraception and gay marriage. More recently, the abuse scandals have dominated coverage of the church. But in poorer parts of the world like Latin America, such matters take a back seat to concerns about poverty and development, Winters says. On issues like these, the church has taken positions that would sound positively left-wing coming from a U.S. politician, Winters says. In his World Day of Peace message this year, Pope Benedict identified the biggest threats to world peace as terrorism, international crime and "unregulated financial markets," Winters notes. "If Barack Obama had lumped together unregulated financial markets with terrorism in the same sentence, Fox News would have talked about nothing else for a month," he says. The church's views are not a rejection of capitalism or market economies, says Steve Schneck, director of the Institute for Policy Research in Catholic Studies at Catholic University in Washington. "But there is with it a suspicion that Adam Smith's invisible hands need to be guided by a moral heart if we're to have justice," he says. Pope Francis served as cardinal at a time when Argentina faced a severe debt crisis that would ultimately lead it to default on its bonds. 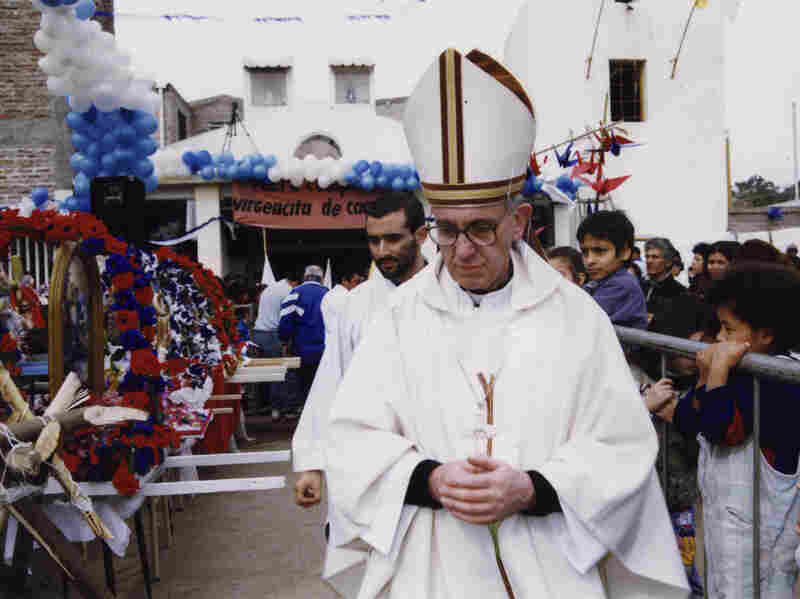 At the time, Pope John Paul II was calling on rich countries to forgive the debt of poor ones, and Argentine bishops sometimes made strident comments about the economic carnage they were witnessing. "For them, there was something immoral in the international economic system that allows these kinds of gross inequities of wealth to exist," Schneck says. "That has always been his role, advocating for just, fair economic solutions so the most needy be benefited," says Mario Paredes, director of Catholic Ministries of the American Bible Society. "In a country that [is] so rich, like Argentina, to find those pockets of poverty it is unexplainable. And he is fully aware of that, and that is the reason he has spent all these years visiting the slums of Buenos Aires, because the poverty there is rampant." But these remarks came at a time when the former Cardinal Bergoglio was also acting as a bulwark against the spread of liberation theology, which was embraced by many clerics in other parts of Latin America. Bergoglio saw the movement as tainted by Marxism, something he felt was fundamentally at odds with church teaching, says Samuel Gregg, research director of the Acton Institute. To Bergoglio and the church, any economic doctrine that views human beings as consumers and producers "loses sight of the transcendent purpose of human life," Schneck says. "I think that for Pope Francis that narrow understanding of the human person is in many ways similar to the narrow understanding of the human person that he sees at the heart of modern economic systems generally," he says. "So from our perspective, he would look like an economic liberal, but he's certainly no Marxist by any stretch of the imagination." Bergoglio also feared that too much involvement with liberation theology would politicize the church, Gregg says. "Once you take sides in a very political way, the church's ability to act as a mediating institution is automatically diminished," he says. The church has long stressed the importance of helping the poor; it has traditionally allowed for a wide range of opinions about the best way to do that, Gregg says. For that reason, he expects the new pope to maintain a certain critical distance from political debates. "When it comes to the economy, the focus is much more upon articulating the principles of Catholic social teaching of Catholic ethics, rather than proposing detailed five-point plans for dealing with concrete situations, because, frankly, that's the role of lay people rather than the clergy," Gregg says. Schneck expects Pope Francis to serve as "a moral cheerleader on economic issues," just like his predecessors. But with his background in Latin America, Francis is likely to give the issue a special emphasis, he says. "Of course, Pope Francis is going to value what the markets can do," Schneck says. "But there is a critical gleam in his eye when he looks at market forces that we didn't see in John Paul II."